March through June seems to be the time most people get married. The beautiful blooms and flowering trees provide beautiful backdrops for outdoor photos. Just last weekend, we attended the wedding of a friend's daughter. It was a wonderful outdoor venue with lots of natural stone. Although the clouds threatened a bit of rain, not a drop fell. The bride was beautiful and the groom was beaming. All the adults were crying, of course. If you have a wedding coming up, you'll want to check out the huge collection of creative wedding invitations at Minted. From traditional to contemporary artsy designs, they will help custom create the perfect wedding invitation for your special event. 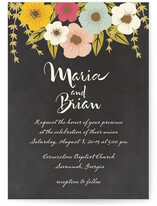 I love the unusual invitations because they allow future couples to pick something that truly aligns with who they are. Their website is very easy to navigate and their online designer application allows you to choose a design, add your wording, try out different color options, and so much more. Plus every single design they offer can be customized to the colors of your wedding if you want! 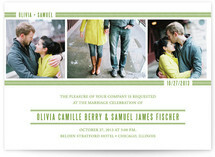 Many of the invitations allow you to upload favorite photos as part of the design. Need inspiration for wedding theme ideas? 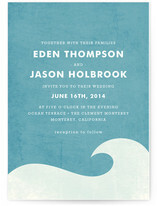 Minted.com is a great place to start browsing for ideas! Minted is not just limited to wedding invitations, so you can search their entire collection to create invitations for any type of celebration you may have coming up this spring. They often offer special promotions and discounts, so follow them on Facebook, Twitter and Pinterest!